Trees and volunteer boxwood hedges grow faster than you think. This year’s winter garden in the fifth in our backyard. In those five years the random hedge volunteers that sprouted up in our neighbors backyard, right long the fence that divides our properties, have grown into these massive, unsightly things that not only block our view of the mountains, but also block a lot of the sun that my garden used to get early in the day. In those same five years the oak tree that sits at the southern edge of our property has gained at least 6 feet in height. My once sunny-ish winter backyard has become a pretty shady one. I am worried the garlic may not survive. I can’t wait for spring and a sun than travels higher in the sky. 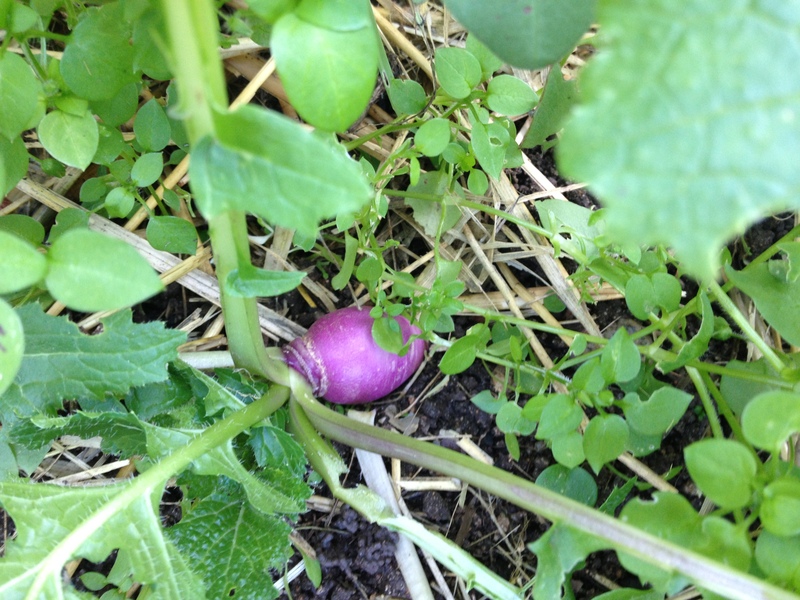 The turnips are doing miraculously well, providing I can’t imagine they get much more than an hour of sunlight a day. 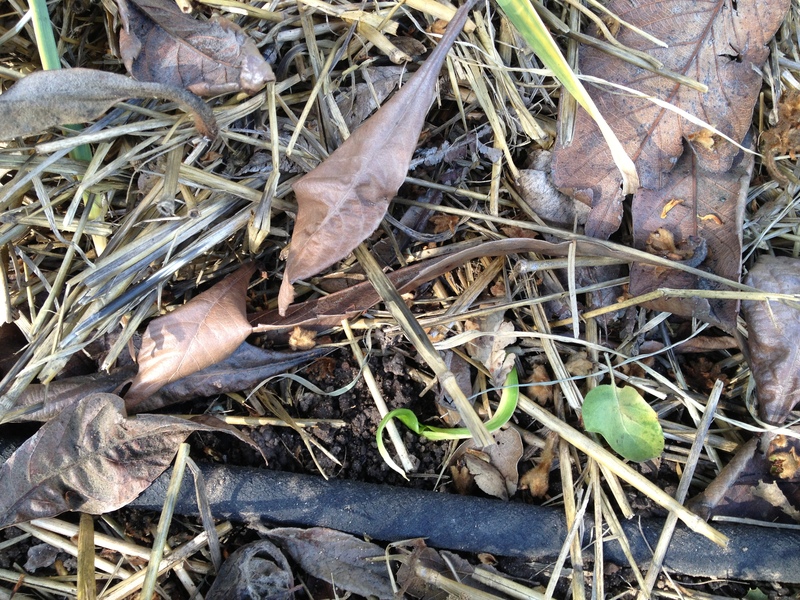 The fava beans are in the same bed, and not doing well. They are covered in aphids. I planted this bed, knowing it doesn’t get much light, but thought I would give it a whirl. I usually plant the garlic in the beds closest to the house, but decided to try a new place, not knowing they would be in so much shade. They are struggling (I hope not rotting). Some rows look okay, with healthy stalks standing about 9 inches high, but other rows look like this. The plants are barely there. Maybe when things warm up and the days are longer, these stunted stalks will shoot up. Fingers crossed. 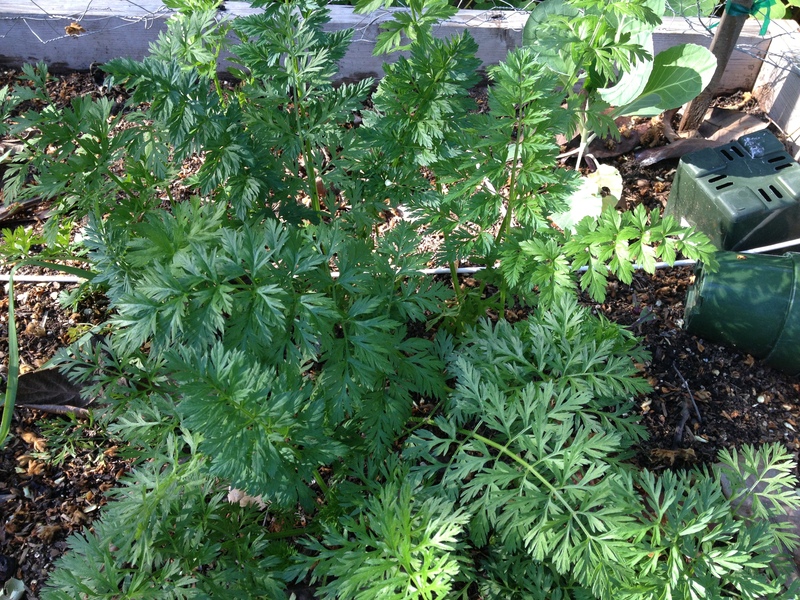 This patch of carrots is looking very good, and should be ready to harvest pretty soon. 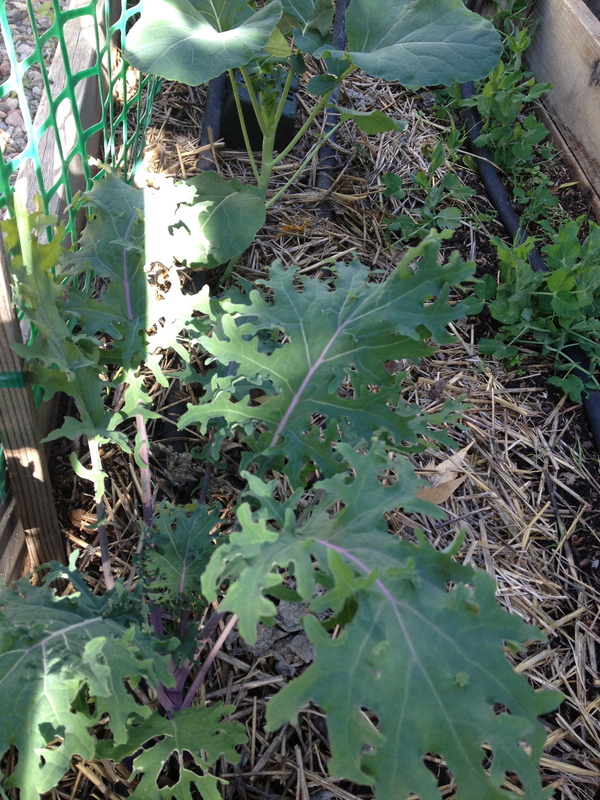 The kale, broccoli, and cabbage are all looking good (in the bed where I usually grow garlic). You can see the peas in this bed too, hanging out, waiting for a little more warmth to make their climb up the trellis. 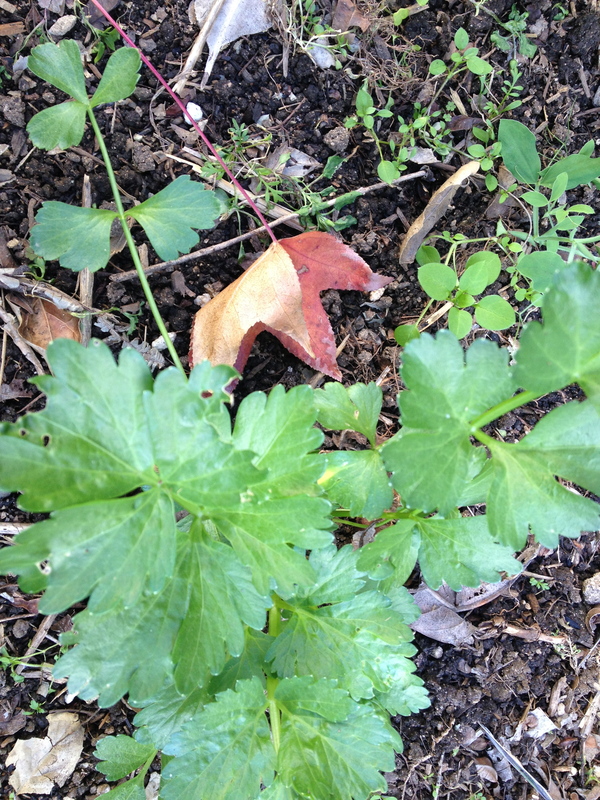 And last, but not least, I am growing celery for the first time! Beds that used to get a fair amount of winter sun are now in shade most of the day. I may be forced to pare down the winter garden to just the beds surrounding our back patio next year. The sunniest spot in the backyard is the spot where we have a little bit of lawn, the only lawn on our property. I am sometimes tempted to tear it all up and expand and/or move the garden. Maybe, someday. HAve you tried growing more things in pots in the winter and moving them to the sunniest areas of your garden? I had the same problem with garlic and although they formed into perfect heads they were absolutely tiny. 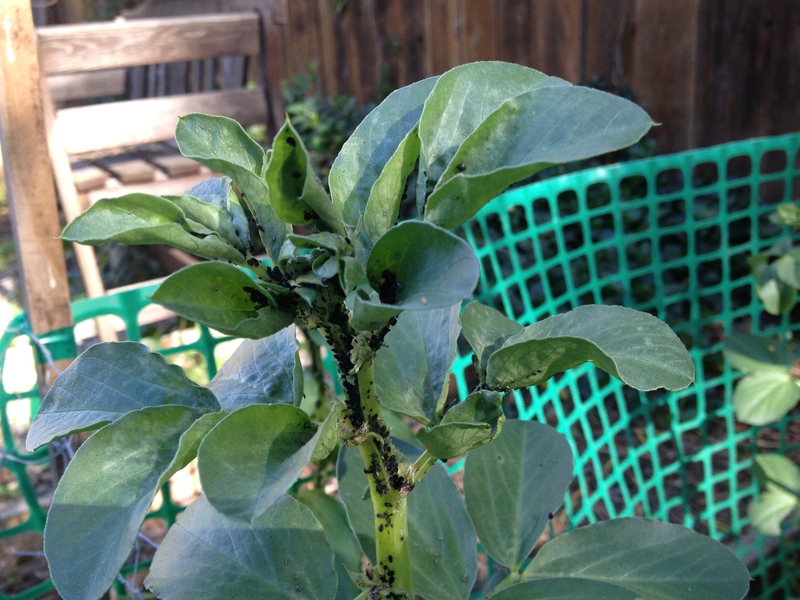 I spray my Favas beans with a washing up liquid solution to get rid ot the aphids…good luck! Pots! Of course! I have potatoes in a few pots on the back patio. Celery in another. But, you are right I could certainly do more. I don’t know why I didn’t consider that before. Thanks! Yes, the aphids certainly need a washing, just need to make the time to do it ;). Time is always our enemy 😦 I’ve not ried celery in pots. I’ll have to see if I can buy the seedlings. Hi! For someone with a black thumb like me, your blog is great, so I’ve nominated you for the Versatile Blogger Award. It’s not a huge thing and don’t feel obligated to do anything about it if you don’t want, but I though tyou deserved it! http://jasonarust.com/2013/01/15/a-funny-thing-happened-at-bath-time-saturday-night/.